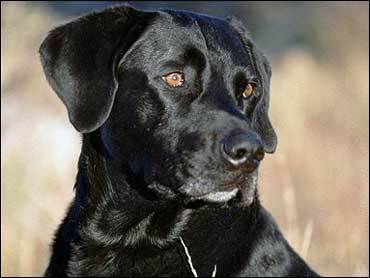 A black Labrador that burrowed through smoking debris after Sept. 11 and flooded rubble after Hurricane Katrina in search of survivors has died of cancer. Owner Mary Flood had 12-year-old Jake put to sleep Wednesday after a last stroll through the fields and a dip in the creek near their home in Oakley, Utah. Flood said Jake had been in pain, shaking with a 105-degree fever as he lay on the lawn. No one can say whether the dog would have gotten sick if he hadn't been exposed to toxins at the World Trade Center or one of his other missions, but cancer in dogs Jake's age is common. Some owners of rescue dogs who worked at ground zero claim their animals have died because of their work there. But scientists who have spent years studying the health of Sept. 11 search-and-rescue dogs have found no sign of major illness in the animals. Many human ground zero workers have complained of health problems they attribute to their time at the site: the largest study conducted of about 20,000 ground zero workers reported last year that 70 percent of patients suffer respiratory disease years after the cleanup. The city earlier this year added to its Sept. 11 death toll a woman who died in 2002 of lung disease, five months after she was caught in the dust cloud of the collapsing twin towers. The results of an autopsy on Jake's body will be part of a medical study on the Sept. 11 dogs that was started by the University of Pennsylvania more than 5 years ago. Flood adopted Jake as a 10-month-old puppy. He had been abandoned on a street with a broken leg and a dislocated hip. "But against all odds he became a world-class rescue dog," said Flood, a member of Utah Task Force 1, a federal search-and-rescue team that looked for human remains at ground zero. On the evening of the team's arrival in New York, Jake walked into a fancy Manhattan restaurant wearing his search-and-rescue vest and was treated to a free steak dinner under a table. Flood eventually trained Jake to become one of fewer than 200 U.S. government-certified rescue dogs — an animal on 24-hour call to tackle disasters such as building collapses, earthquakes, hurricanes and avalanches. After Katrina, Flood and Jake drove from Utah to Mississippi, where they searched for survivors in flooded homes. In recent years, Jake helped train younger dogs across the country. He showed them how to track scents, even in the snow, and how to look up if the scent was in a tree. He also did therapy work with children at a Utah camp for burn victims and at senior homes and hospitals. "He was a great morale booster wherever he went," Flood said. "He was always ready to work, eager to play — and a master at helping himself to any unattended food items." She said Jake's ashes would be scattered "in places that were important to him," such as his Utah training grounds and the rivers and hills near his home where he swam and roamed.